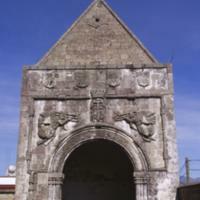 This posa, or outdoor chapel, was built in the mid-to-late 16th century. 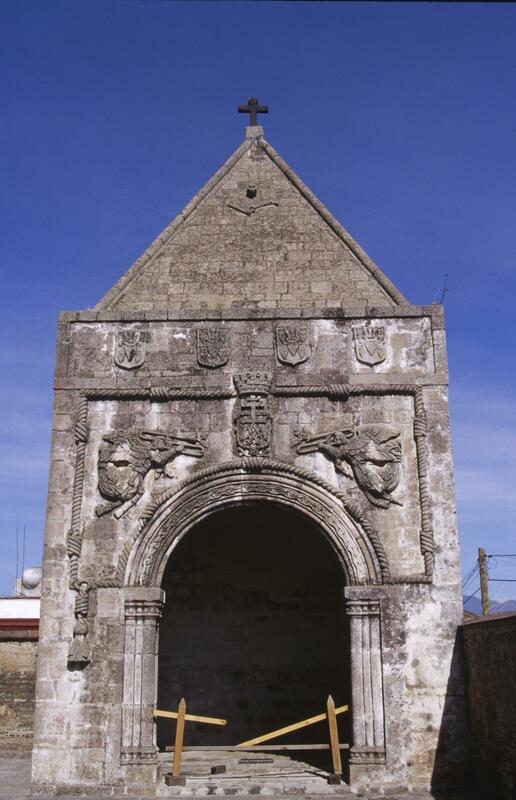 It is one of four posas in the courtyard of San Miguel, Huejotzingo. When it was built, the town was dominated by Nahuas and it was Franciscans who evangelized and supervised the building of San Miguel. The outdoor chapels, which stand approximately 15 feet high (4.6 meters), would have originally held altars and been visited during processions held in San Miguel’s courtyard. Two trumpet-playing angels grace the façade of this posa, announcing the Second Coming of Christ. A program of eschatological imagery is found both at Huejotzingo and in other Franciscan monasteries nearby. Framing them is a carved cord, studded with knots, a Franciscan symbol. It refers to the corded-belt worn first by Saint Francis and then, later, by friars dedicated to his teachings. In the four shields above, the pinecone shaped objects are the blood from Christ’s wounds during the Crucifixion. They had particular meaning to Franciscans since Saint Francis, the founder of their order, mysteriously received similar wounds, or stigmata. The modern fence within the arch is meant to discourage visitors from entering and defacing the posa. Franciscan friars were the first patrons of San Miguel. Working under their supervision, indigenous stone-cutters, carvers and other laborers (including women who provided food for the workers) built this complex. While the initial structures may date from the late 1520s, the posas probably date from 1550-1570. The posas were built of stone and set at the four corners of church courtyards. The plan of each is rectangular, and through the doorways, one could have seen an altar. Buildings with arched doorways represent an architectural tradition introduced from Europe. In pre-Hispanic times, there were many sophisticated ways of building, but no arches. Posas, at San Miguel and other church complexes in Central Mexico, represent an architectural innovation in New Spain. As sites visited along processional routes that threaded their away around the large church plaza, the posas set at the four corners of the plaza were not merely part of church complexes, they were integral to Christian rituals. They were first built in the 16th century, because evangelization required new structures—both physically and intellectually—to accommodate indigenous converts. The four posas at Huejotzingo are not unique in size or function, but their carefully planned iconographic program, featuring eschatological themes favored by Franciscans, sets them apart. Franciscan friars made Huejotzingo, in particular, an important center of conversion and teaching. One of the most ambitions and famous of the early Franciscan friars, Fray Motolinia, worked at Huejotzingo in the late 1520s. San Miguel still bears many traces of Franciscan ambitions. Its posas have unusually elaborate imagery. And the church contains a retable (retablo) signed by Simon Pereyns, one of the most accomplished European painters to work in 16th-century New Spain. Córdova Tello, Mario. 1992. El convento de San Miguel de Huejotzingo, Puebla. Mexico City: INAH. Edgerton, Samuel. 2001. Theaters of Conversion: Religious Architecture and Indian Artisans in Colonial Mexico. Albuquerque, New Mexico: University of New Mexico Press. Kubler, George. 1948. Mexican Architecture of the Sixteenth Century. New Haven, Connecticut and London: Yale University Press.